Farming is in Wilder Jones's blood. 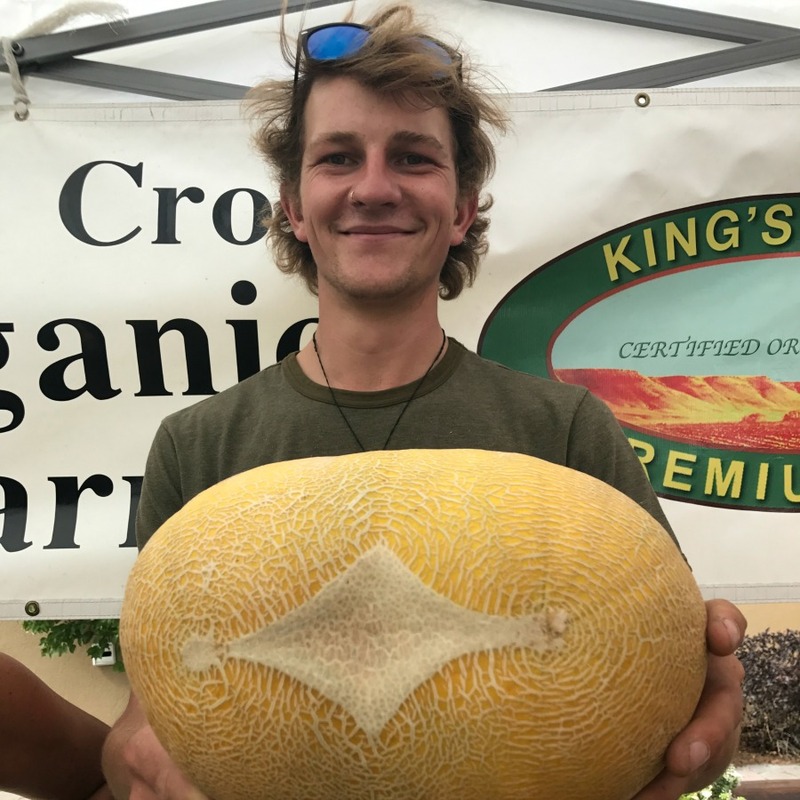 The son of King's Crown Organics owner Nate Jones, Wilder grew up on the family's diversified row crop farm - one of the first certified organic in Idaho - located along the Snake River in Southern Idaho. A fourth-generation farmer, he connects to the land through food production, permaculture principles and ecosystem understanding. Be sure to stop by and say hello to Wilder on the Tuesday market in Ketchum! Learn more about about Wilder and King's Crown Organics. As a 4th-generation farmer, did you always plan to continue working on the family farm? No. Coming home for me was more of a feeling. I wanted to have my hands in the dirt. And be on the land that raised me. It was a tipping point really when I was at my first PDC (permaculture design course) in Costa Rica. I really wanted to put my new knowledge to work. King’s Crown is certified organic. What does that mean to consumers? As a consumer that means that whatever product you're getting whether food or fiber is grown WITHOUT synthetic fertilizer, herbicides, pesticides, fungicides, or genetically altered seed. How do organic practices promote soil health? Soil science is making leaps and bounds. Gone is the reductionist paradigm of NPK; Nitrogen, Phosphorus, and Potassium. A holistic understanding has emerged that allows the biology of the soil to reveal itself. The soil is very alive and finds itself in a cyclical food chain. From microscopic bacteria and fungi to nematodes, springtails, earthworms, and field mice the evolution of dirt to soil is a very alive process. Needless to say a farm in a lot of ways ignores the succession of the soil. Tillage being one of the worst proponents. However, by practicing organic methods the soil is able to live without the use of chemicals. All dirt has all the nutrients necessary to grow plants. It only lacks life. That's what makes dirt, soil. Everyone who knows permaculture gets to try to answer this question. Permaculture is a way of conducting yourself that is modeled after the natural world's processes. How do you incorporate permaculture practices into a commercial farm? Often the biggest permaculture element that we incorporate is borders. Borders and edges allow for diversity and refuge. We have our fences around our fields because we incorporate livestock. We aren't the type of farmers to farm all the way to the highway. We care about our portion of the earth and we care about the people that make it all possible. Do you have a farming/agricultural hero? My farming hero would have to be Joel Salatin. I admire his non-conventional methods and enthusiasm about food and the food system. I want to see chemical free farming come to life. I'm not stuck on organic certifications. In an ideal world there wouldn't be a premium on organic food. It would just be food. So I encourage all farmers not to get stuck on what side of the fence to be on organic or conventional. Be bold, be brave, and be open to a life of abundance when you take the chemicals off the table. What do you wish people understood better about farming? I think there is a huge disconnect amongst not just people and the consumers but also farmers. I wish people saw all land as an ecosystem. Even if it's fields with water spread all over it Mother Nature is out there doing her thing. And watching her is one of the most beautiful things. There are frogs on my farm. Frogs! The pinnacle of a healthy ecosystem. I don't know what they do for me if anything. But we get along. Just like everyone and everything should. Farming doesn't have to be a depletion of resource. It can be a renewal of resources. Soil, food, carbon, health, and spirit! What’s your favorite food to grow? I love to grow watermelon in our vegetable garden and dry beans in the field. Watermelon because nothing beats the heat like a watermelon on a 115-degree day. Dry beans because the do so well here and are light on the soil. Also, they're the last thing planted, and the first thing harvested. What local food products do you produce or sell? Beef, alfalfa, corn, grass, beans, potatoes, onions, winter squash, pumpkins, sweet corn, melons, watermelon, tomatoes, cucumber, eggplant, peppers, zucchini, and I'm sure I'm missing a few. Where are your local food products available for purchase? Atkinsons’ Market (seasonally), Boise Co-op, Whole Foods Boise, Wood River Farmers’ Market in Ketchum on Tuesdays. and Boise Farmers’ Market.